A few rough paths run along the rocky banks above the Colorado at the end of Peach Springs Canyon, extending a few hundred meters both east and west of the junction with Diamond Creek, and it is relatively easy to continue further, clambering over boulders and squeezing past cacti. In some places the river flows beneath sheer cliffs a few meters high; in other there are small sandy beaches and pools, but always the current is very swift and the water is cold. As usual, numerous lizards are found amongst the rocks, and there is a fine assortment of cacti. It takes about one hour to traverse a mile or so eastwards, far enough to see beyond the next major bend in the Colorado, as it turns sharply north. Scrambling up the canyon walls gives a better view, but not without some effort as the cliffs are steep, and have areas of loose rock. 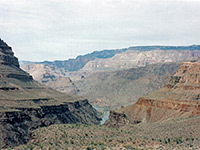 An even better view of the Diamond Creek area may be attained by climbing the canyon walls at either side of the junction with the Colorado. It is relatively easy to scale the cliffs to the west; the main obstacles are the many spiky cacti that grow in crevices and on ledges. To scale the steep 250 foot granite rock layer takes around 10 minutes; after this, the land is flatter and less rocky, and remains so for a few hundred feet. Further above there is a thick vertical layer of limestone which is not easily climbed, but the river may be followed upstream for several miles along the flat land above the inner canyon gorge. There are great views in all directions; a long distance up and down the canyon, across to many convoluted cliffs and buttes on the edge of Shivwits Plateau north of the river, and of the lower end of Diamond Creek and Peach Springs Canyon. 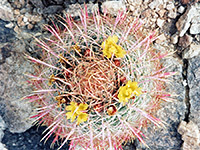 There are many fine examples of large cacti, some of which occur in quite localised zones, such as cholla that are found only around south-facing ledges, and large ferocacti on flatter, more sandy terrain. This is one area where it is possible that no-one else has ever stood.